So far, we've seen only a portion of the the site that is Gobekli Tepe. But, Gobekeli Tepe is only 5 percent excavated. 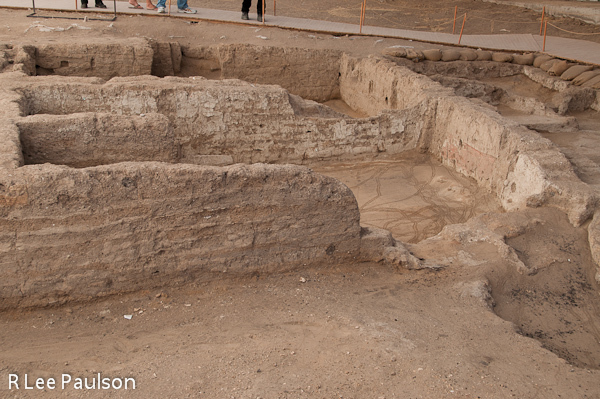 Several fenced off areas can be seen where partial excavations along precise grids have begun. One can see from even these partial excavations that much is yet to be learned from this site. 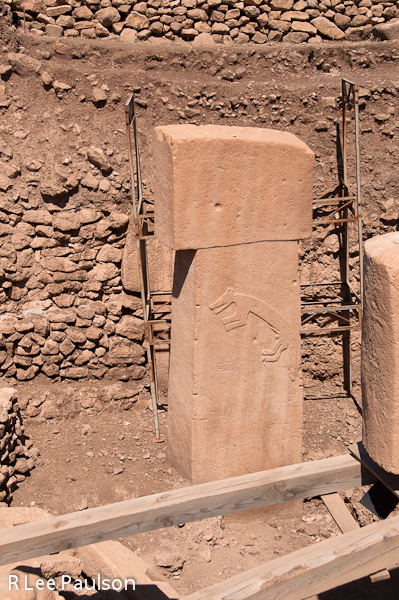 One of the things that makes Gobekli Tepe so special is the decorations on many of the stones have been carved in high relief. Carving in high relief means that the design sticks out from the block, as seen here. Current theories on the history of mankind would have us believe that the folks back around 9,000 BCE were "primitive" hunter/gatherers. All aspects of this site belie that notion. In the first place, carving designs in high relief is exponentially harder than carving a design into the stone. Gobekli Tepe, is an ancient ceremonial site located approximately 9 miles northeast of Urfa, in the Anatolya region of Turkey. It is the oldest known human-made religious structure ever found. Parts of it date back to between 8800 and 9130 BCE. (Find Gobekli Tepe on Google Maps: 37.2233,38.9224.) 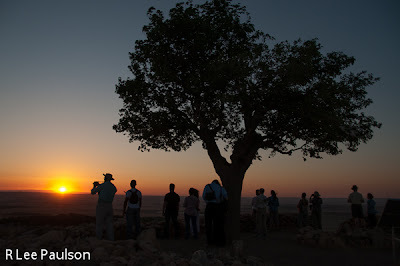 Our first glimpse of this remarkable site came at sunrise on the last day of our trip.This tree is shown here because its existence is what gave archeologists the large clue that something special was worth excavating here. 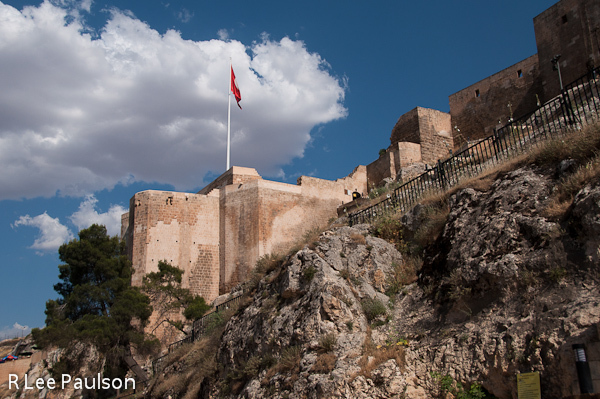 Urfa is a city of nearly 500,00 in SE Turkey. It first shows up in records from the 4th century BCE, but it could easily date back to 9000 BCE as it was one of several cities in the Euphrates-Tigris basin, the cradle of the Mesopotamian civilization. According to Turkish Muslim traditions, Urfa is the city of Ur of the Chaldees in the bible, and the birthplace of Abraham, due to its proximity of Harran, 30 miles to the south. However, according to Wikipedia, other scholars claim the city of Ur is in southern Iraq. Harran is a city 30 miles south of Urfa in SE Turkey and about 8 miles north of the Syrian border. 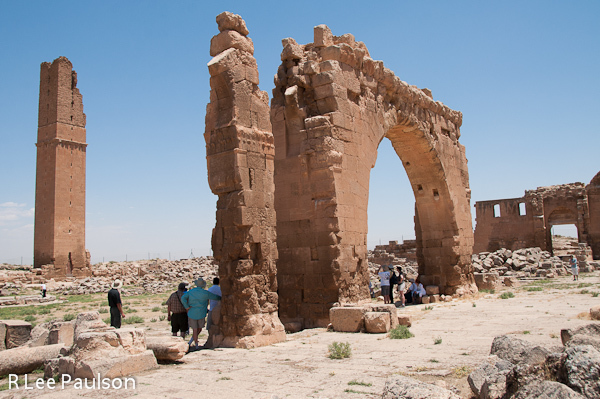 Harran is said to be one of the oldest continuously inhabited spots on earth. Earliest records of it date back to 2,300 BCE. Abraham of the old testament is said to have lived here for a time. Sadly, not much of the old city is left. Here, we are standing among the ruins of the Grand Mosque. 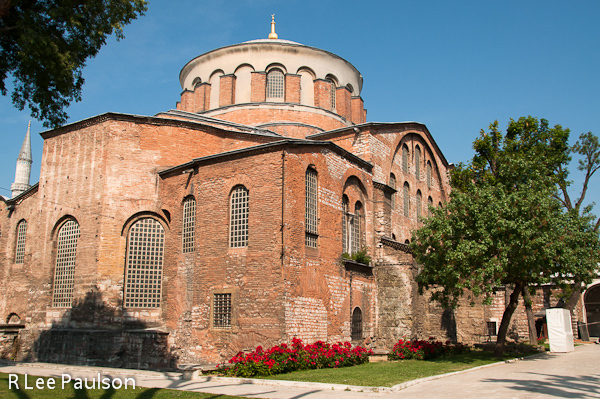 Built in the 8th century AD, it is the oldest mosque built in the Anatolia region. It is said that western civilization owes this place a great debt. We've now traveled further east in southern Turkey to Mount Nemrut. 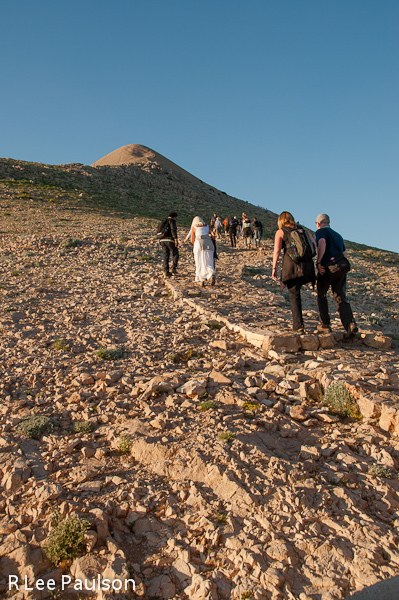 Mount Nemrut, at 7,001 feet, has a peak artificially created out of thousands of cubic yards of crushed rock. 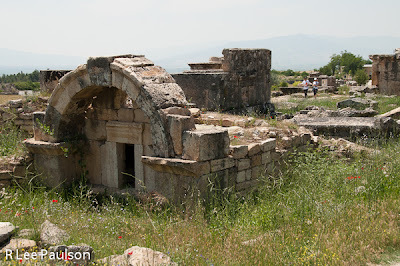 It is thought the tomb of King Antiochus I Theos of Commagene lies under all the crushed rock. But, that isn't the only thing that makes this place interesting. Here, we see the peak in the distance as we hike to the summit just before sunset. 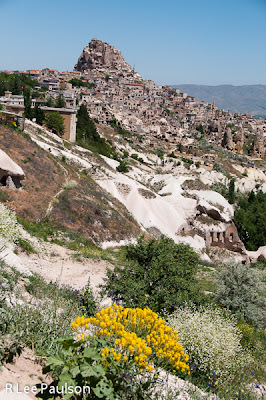 Goreme is another area in Cappadocia which has large amounts of the same soft volcanic rock that we saw previously in Kaymakli Underground City. Here, the stone has been carved to make above ground structures. We stopped at a vantage point for this particular area, where people are still comfortably living in these places even today. 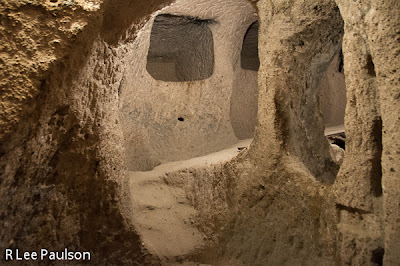 Kaymakli is one of 36 underground cities in the Cappadocia region of Turkey. It is carved out of soft volcanic rock that is indigenous to the area. This particular city has 8 underground floors, 4 of which are open to the public. Some of these underground cities date as far back as 1,800 BCE. 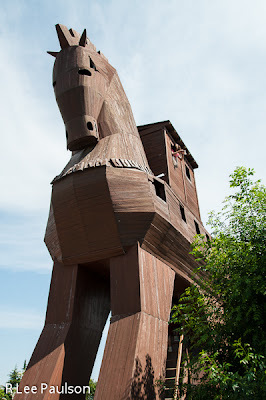 It is believed they were primarily used to protect local inhabitants from marauding invaders looking for plunder. 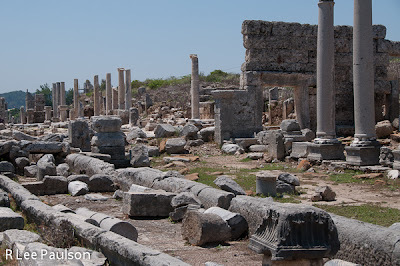 So far, we have been looking at mostly Roman ruins that date back 2,000 years or so. 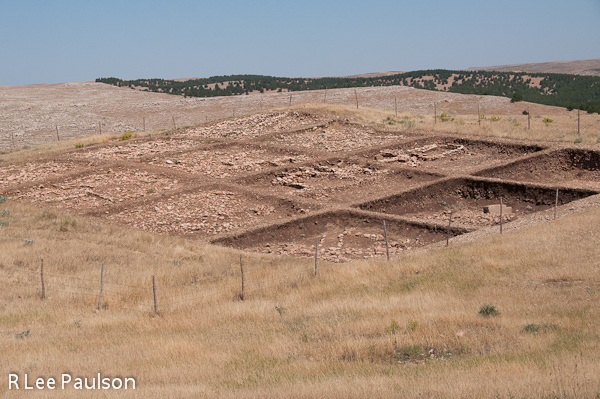 Catalhoyuk, the largest and best preserved Neolithic habitation site found so far, dates back to 7500 BCE. It appears the site was inhabited for roughly 2,000 years. As one can see, folks lived in mud-brick houses all clustered together back then. It is thought that the dwellings were roofed with timbers and entered from above. The Mevlana Museum in Kona, Turkey, is one of most important religious and mystical sites of Turkey. 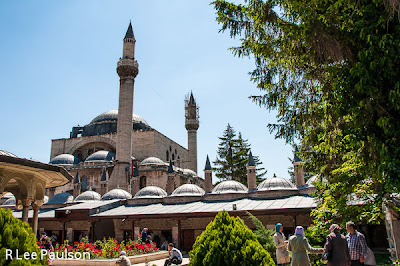 According to Wikipedia, it is the Mausoleum of Jalal ad-Din Muhammad Rumi, a Sufi mystic also known as Mevlana, or Rumi, the founder of the Mevlevi order, better known as the whirling dervishes. The city of Aspendos harks all the way back to 800 BCE, but it had its golden age in the second and third centuries AD. This theater was built during the reign of Emperor Marcus Aurelius, AD 61-80. 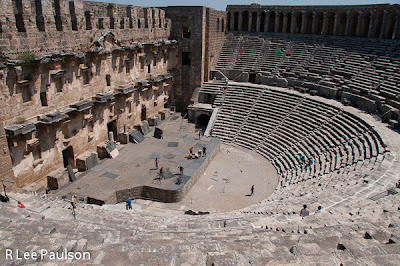 The difference between this and other Roman theaters we've seen is that this one, which seats 15,000, is still actively in use today. Perge is another very ancient city important to the Roman empire. St. Paul settled the first school, or basilica of Christianity here. The truth is that by this point, all of these ruined cities were beginning to look the same. However, there are a few special details that I'd like to show you in this one. 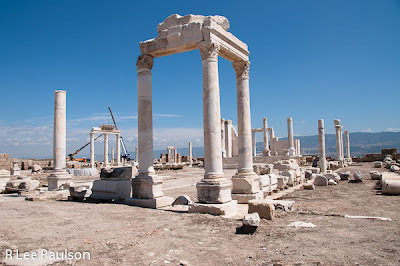 It is known that settlements at Laodicea go back to at least 3,500 BCE, maybe even earlier. This is one more example of the ancients' habit of building over older settlements. Here they are reconstructing a temple from pieces of rubble found laying nearby. 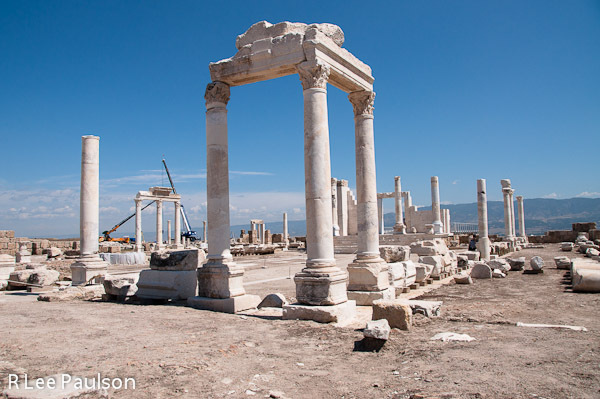 Laodicea was destroyed by earthquakes many times, the last being in the 7th century, after which it was abandoned. The next morning they took us to a leather factory, where we were ushered into a room with a runway in the middle and seats around the perimeter. 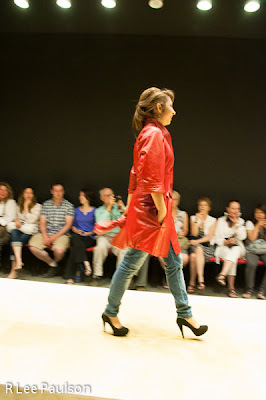 The music came up and models wearing different styles of leather coats began walking the runway. This sort of thing often happens on tours. People have come to Hierapolis from time immemorial to soak in the the healing waters of the thermal hot springs here. Today, there are modern pools near the center of what used to be downtown ancient Hierapolis that allow visitors to soak their weary feet. 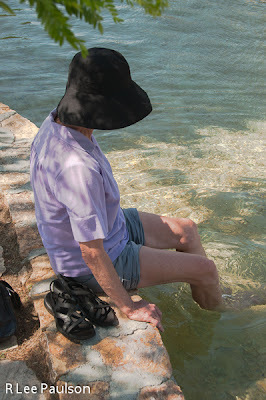 After a long walk on a hot day, I have to say the healing waters felt wonderful. 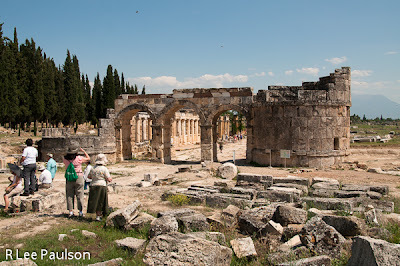 One enters Hierapolis from the necropolis through three ancient arches. This is the north entrance, called the Domitian Gate. In its heyday, in the 2nd and 3rd centuries, Hierapolis claimed 100,000 inhabitants and was a prominent city in the Roman Empire. Hierapolis, according to Wikipedia, was founded as a thermal spa in the 2nd century BCE. People from all over came here to find healing in the thermal pools, which we will see in a later post. They also came here to die. We entered Hierapolos from the north, which brought us first through the Necropolis, the area where the dead were left to rest. The bodies were long gone. 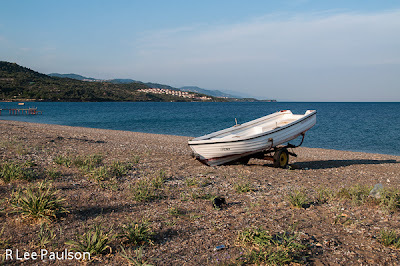 We had the opportunity to wander through what was left. 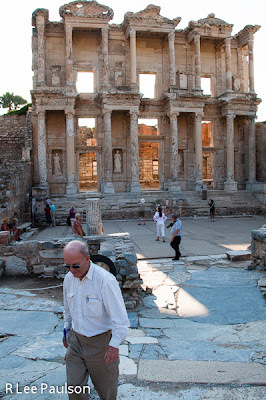 At the end of the main street, we came to a square and found what remained of the ancient library of Ephesus. Holding over 12,000 scrolls, this library was the third largest library in the ancient world. 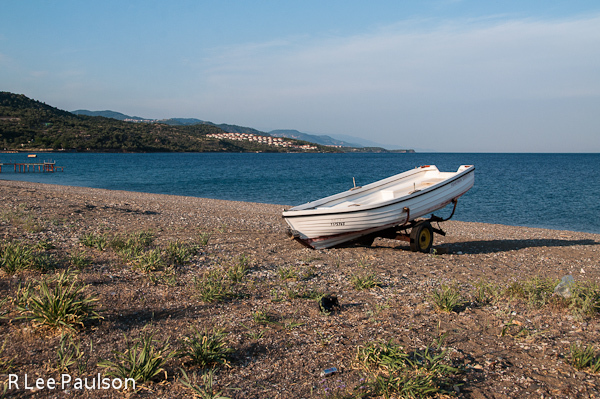 Only the libraries of Alexandria and Pergamon were larger. Settlements in and around Ephesus have been dated back to 6,000 BCE and before. 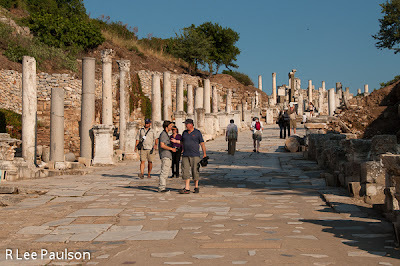 However, Ephesus reached its peak in the first and second century AD under Roman rule, when it had between 400,000 and 500,000 inhabitants and was considered second only to Rome in its importance to the empire. 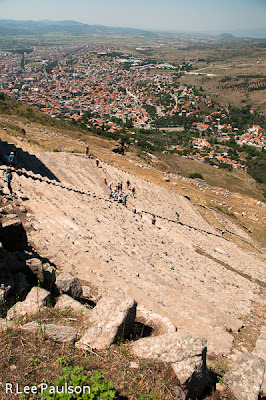 As mentioned before, Pergamon sits on the top of a hill overlooking the Turkish city of Bergama. According to Wikipedia, Pergamon's amphitheater seats 10,000 people and has the steepest seating of any known theater in the ancient world. The archeological ruin of Troy, the site of Homer's legendary Trojan War, would be remiss if they did not have a life-sized model of the famous horse to greet visitors. 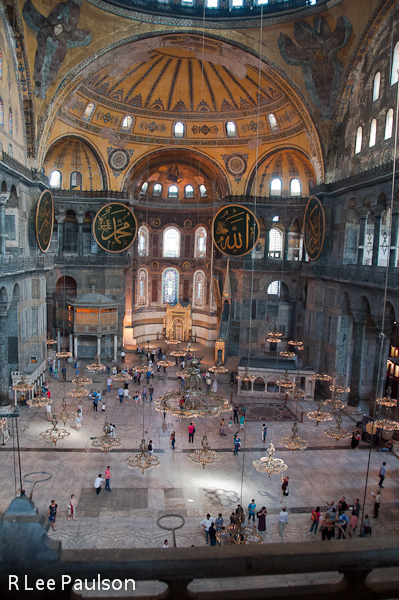 Aya Sofya is Istanbul's most famous monument, according to the Lonely Planet. 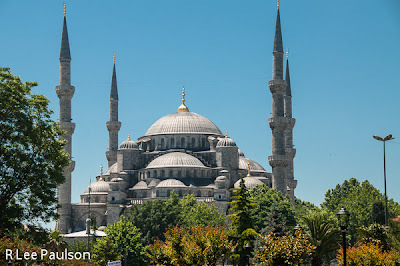 Located near Topkapi Palace in the Sultanahmet district, the Blue Mosque, completed in 1616, is considered to be the last great mosque of the classical period. According to Wikipeda, Topkapi Palace was the primary residence for the Ottoman Sultans for approximately 400 years, ending in 1856. I believe this is the outside of the Sultan's residence, which was located inside his fortified compound.There was so so much to see and we moved so quickly that it will be impossible for me to create a comprehensive, photographic travelog type tour in these posts. The short answer is that we wanted to see an extremely ancient archeological site called Gobekli Tepe. 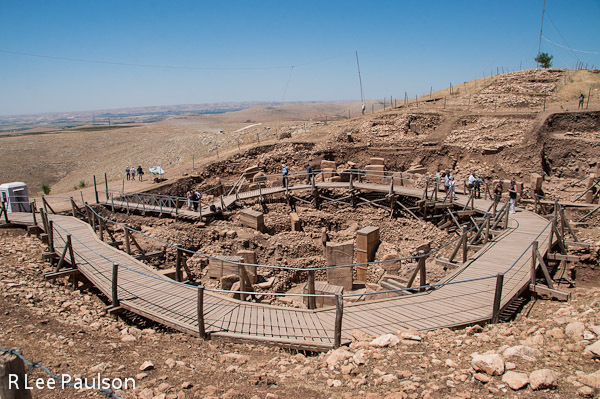 What follows is a much condensed, and hopefully concise, background about why the discovery of Gobekli Tepe has such profound implications to the history of our cultural development. Africa 36: Interesting Facts About Elephants. Africa 35: We Happen Upon a Lion.